David Dungworth works for the Heritage Protection Department and is part of the team that provides English Heritage with specialist skills in heritage science. 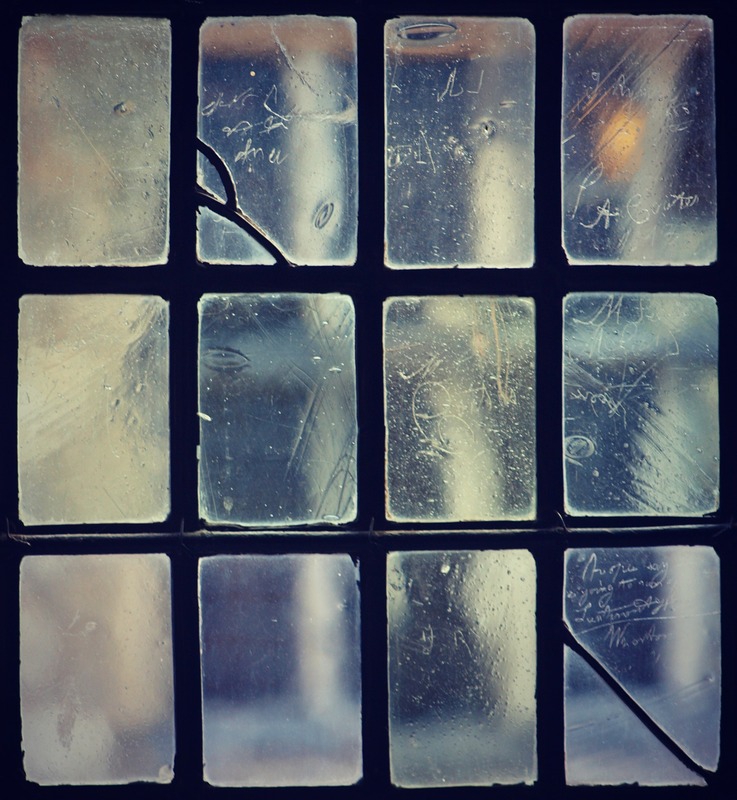 This post is based on his research on historic window glass, where the primary aim is to improve the conservation of historic glass by providing a means to identify which panes are original and which are later replacements. A full list of David’s publications can be found on his LinkedIn profile. I work in a laboratory where we use techniques from materials science to study artefacts and materials, from creation, through use, modification, burial and recovery and subsequent investigative analysis. 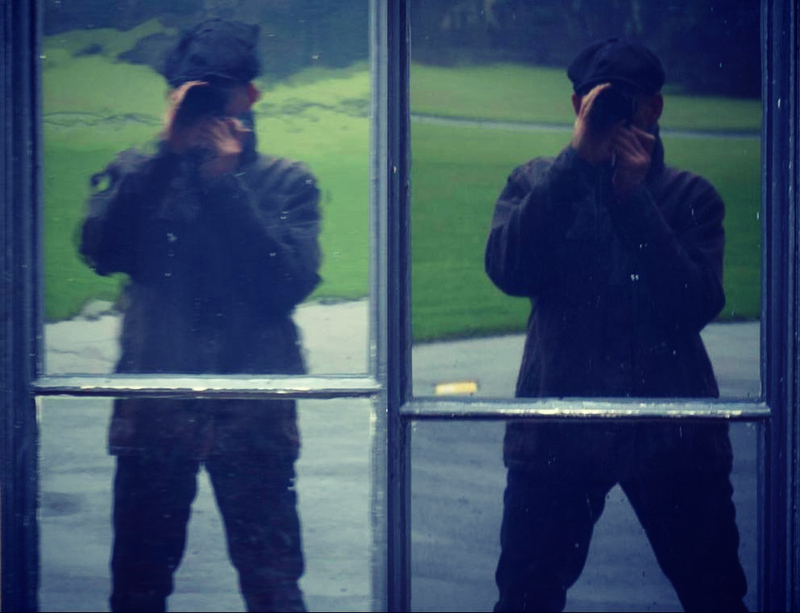 Historic window glass usually has an irregular surface which gives reflected images a distinct quality (left) that is absent from modern ‘float’ glass (right). These two pictures were taken of windows at Audley End. Historic window glass usually has variations in thickness, bubbles and a range of other ‘defects’ (including historic graffiti) which give transmitted images a distinct quality (window at Kings manor, York). One of our recent projects has been looking at historic window glass. In the first phase of the project we collected hundreds of samples of historic window glass from both archaeological and architectural contexts. These were carefully chosen to provide us with some dating evidence for each sample. In the laboratory we analysed each fragment of glass to determine its chemical composition. We found that the chemical composition of the glass reflects the raw materials used to make it and that the raw materials that were available have changed over time. This is me operating a scanning electron microscope (SEM) which was used for the chemical analysis of all of the window glass samples during phase 1 of the project. 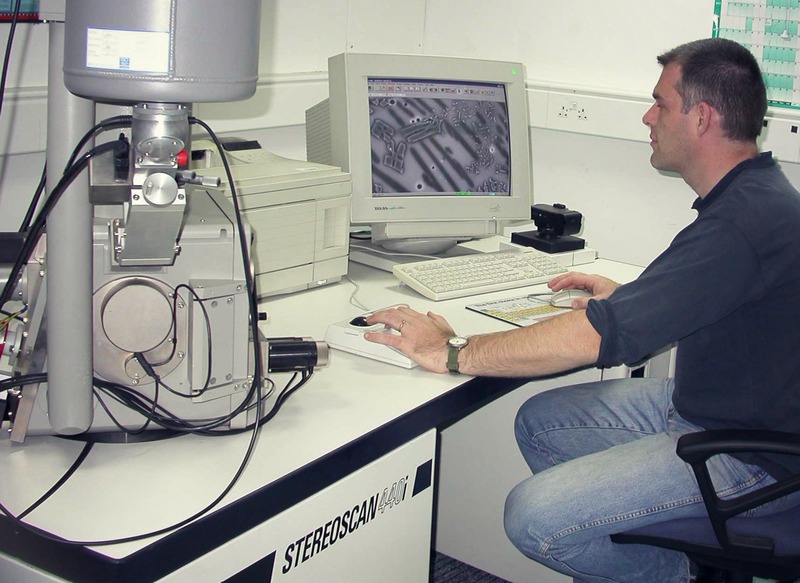 The SEM data is of a high quality but it takes a long time to acquire (English Heritage science laboratories at Fort Cumberland in Portsmouth). All window glass has been made using sand but with the addition of a flux which will lower the melting temperature. The earliest (medieval) glass was made using a flux obtained from the ash of woodland plants (especially bracken). Late in the 16th century, French glassmakers came to England and their glass has a higher calcium content which probably reflects the use of a flux made from tree ash. From the end of the 17th century window glassmakers began to use seaweed ash as their flux and we see this in the strontium content of the glass. In the 1830s the window glass was revolutionised by the introduction of a pure sodium carbonate flux which was made on an industrial scale. Further changes in the chemical composition of window glass are mostly related to the increased mechanisation of the window glass industry. 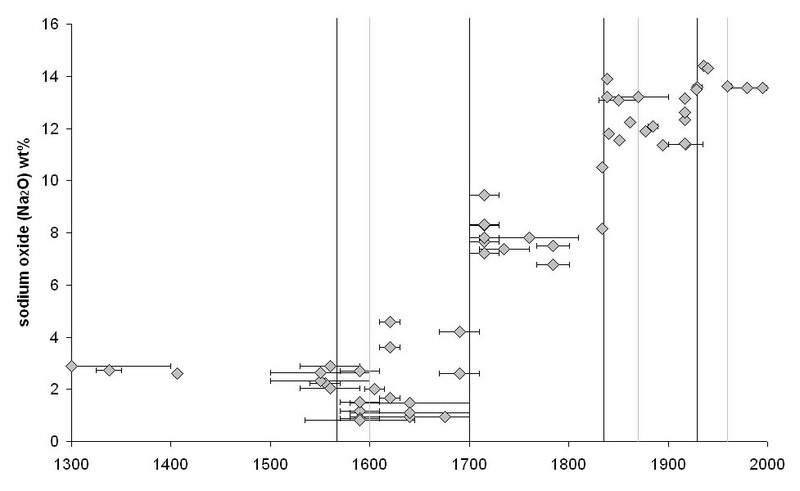 Changes in the concentration of calcium in historic window glass: results of phase 1. 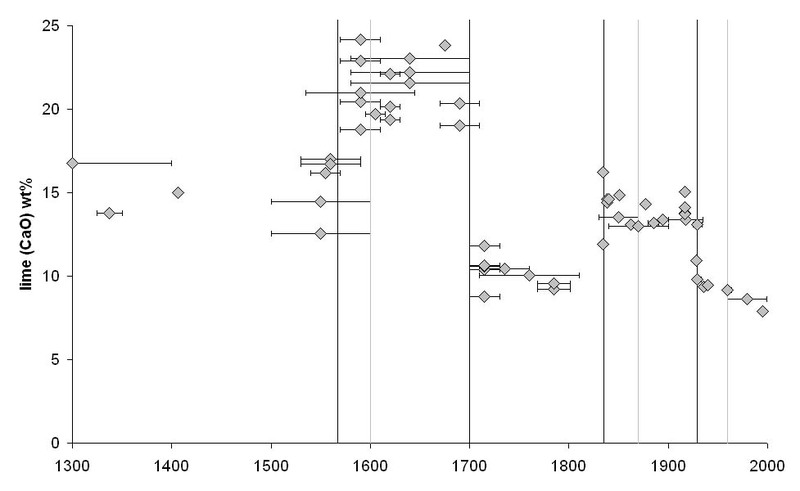 The horizontal axis shows the date of the samples and the vertical axis shows the concentration of calcium. 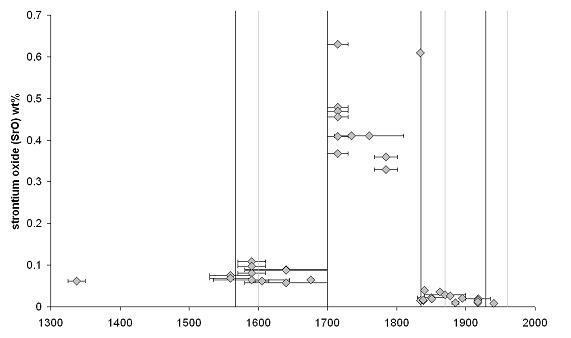 Changes in the concentration of strontium in historic window glass: results of phase 1. The horizontal axis shows the date of the samples and the vertical axis shows the concentration of strontium. In the second phase of the project we used a portable device to analyse surviving glass in buildings. 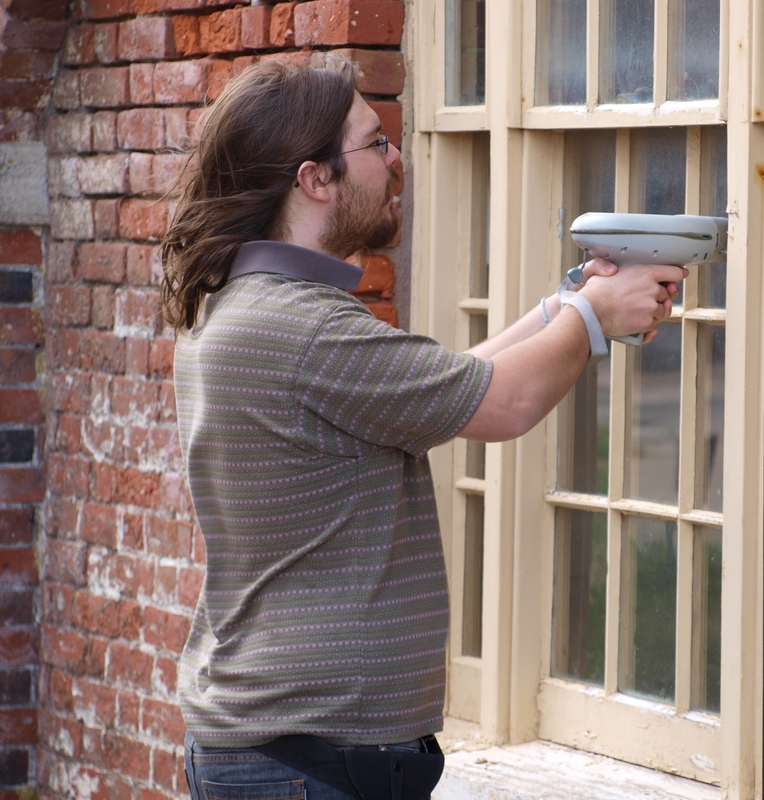 Our first building was Walmer Castle near Deal where we were able to analyse every pane of window glass in three days. We were able to demonstrate the age of individual panes of glass and this should help ensure that surviving historic glass is preserved. Phase 2 of the project: the use of a portable device to analyse window glass in situ and without damaging it (Brice Girbal, EPPIC placement student).